Canadian police are investigating a possible hate crime after a man tried to cut the hijab off a young girl. 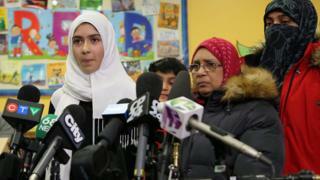 Khawlah Noman, 11, was walking to school with her brother in Toronto when they said a man came up behind her with scissors. Miss Noman said she screamed and her assailant ran, only to return, pull off her hood and cut her hijab. Police describe the attacker as Asian, 20-30 years old, between 5ft 7in and 5ft 8in, with a thin build. The siblings said he had black hair with straight bangs to the eyebrows, a thin moustache and black prescription glasses. He was described as wearing a black hooded sweater with the hood up, black pants and brown gloves. "What you're doing is really wrong," the girl said, "you should not act like this, and especially, I'm a kid." Khawlah said that she is now "actually really scared" to walk to school. The incident has inspired an outpouring of support, including from Prime Minister Justin Trudeau. He said: "My heart goes out to the young girl who was attacked, seemingly for her religion. "I can't imagine how afraid she must have been. Khawlah's mother told media the attack was "just not Canada."